While the 1950s was the decade of the dive watch and the 1960s the epoch of the chronograph, the 1970s ushered in a brand new style of wrist wear—the luxury sports watch. Emblematic of the glamorous jet set of the era that traveled the globe in pursuit of leisurely activities, flaunting a bold casual chic yet expensive steel watch had become de rigueur. Some of these timepieces thrived to become true icons, while others fell by the wayside only to be reborn and revamped for a contemporary audience. 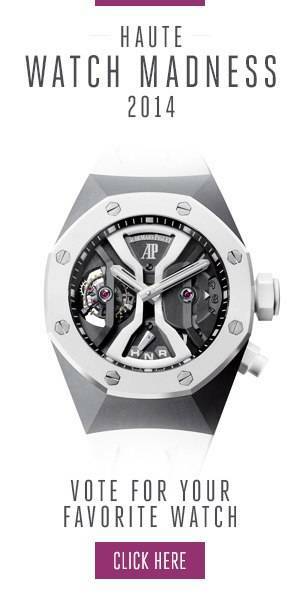 The maiden luxury sports watch that paved the way for the rest to follow, the Audemars Piguet Royal Oak made its debut in 1972 thanks to famed watch designer, Gerald Genta. With its large 39mm case, octagonal bezel with exposed screws, modern integrated bracelet, geometric dial that housed a pair of center hands and a date window, the hefty price tag of this new stainless steel AP watch was, to put it mildly, as shocking as its strong silhouette. Fast-forward to over 45 years later, and the Royal Oak is now Audemars Piguet’s flagship watch, available in a host of different materials and with a wide range of complications. The current direct descendent of that inaugural version, however, is the 2012 Royal Oak “Jumbo” Extra Thin 15202ST featuring a 39mm case, a thicker integrated bracelet, the famed “Petite Tapisserie” dial in blue, and the automatic Caliber 2121. In 1975, Girard-Perregaux not only launched a modern looking sports watch with a sharp case, eight-sided bezel, and integrated bracelet they called the Laureato, but the brand equipped the watch with a modern in-house quartz movement too. Remember, this was Quartz Crisis time, so GP thought it’d be best to jump on the bandwagon rather than fight the trend. After several editions of the Laureato over the following decades—including some mechanical editions—Girard-Perregaux unleashed a large collection of new generation Laureato watches in 2017. Leading the charge is the steel Laureato 42 ref. 81010-11-431-11A with a Clou de Paris dial, octagonal bezel, steel bracelet, and the automatic Caliber GP01800-0025 within. Yet another Gerald Genta creation, the Nautilus was Patek Philippe’s answer to the Royal Oak. Presented in 1976, the Nautilus was also built in steel but featured a case fashioned after a porthole, complete with hinge-like details on the side. Taking the oversized style one step further, the Nautilus case came in at an unheard of 42mm and was fitted with its own integrated steel bracelet. The blue dial, with its horizontal grooves, pair of center hands, and date window at 3 o’clock, was the perfect face of this then-new Patek Philippe luxury sports watch. On the 30th anniversary of the Nautilus, Patek released the most current iteration of the original “Jumbo”—the Nautilus ref. 5711/1A with a larger 43mm case, the addition of the seconds hand on the dial, and the self-winding Caliber 324 S C inside. Vacheron Constantin—the third party of the so-called Holy Trinity of watches alongside AP and Patek—also unveiled a luxury sports watch in 1977, dubbed the 222 in honor of the brand’s 222nd anniversary. Not a Genta design but one conceived by Jorg Hysek, the Vacheron 222 had similar features to other sports watches of the decade with an angular case, integrated bracelet, and a minimal dial with just the hour, minutes, and date. The 222 was eventually discontinued in the 1980s only to be resurrected as the Overseas in 1996. After several versions over the years, Vacheron Constantin launched a fresh steel version, the Overseas ref. 4500V, in 2016 with a 41mm case, a bezel and integrated bracelet inspired by the Maltese cross, a clever interchangeable bracelet system, and the new in-house Caliber 5100.